Homesteaders harvested hay for their animals from the very start, but grain farming began to develop gradually through the last quarter of the nineteenth century. Crops included barley, oats, wheat, and dry peas. According the agricultural census, total county acreage planted in oats reached a high of 2,104 in 1900. 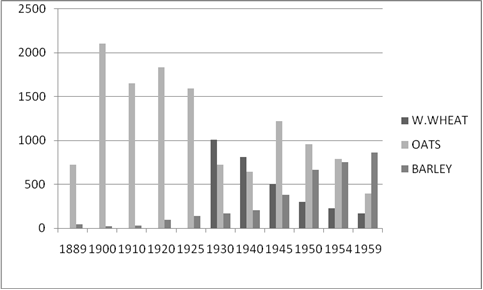 Barley and winter wheat were never as extensive, although the former peaked at 1,007 acres in 1930, while the later peaked at 863 acres as late as 1959. The wetter, less-poorly drained soils of San Juan and nearby Beaverton Valley proved to excellent for some grain production because of the retention of moisture during the long, dry summer season. 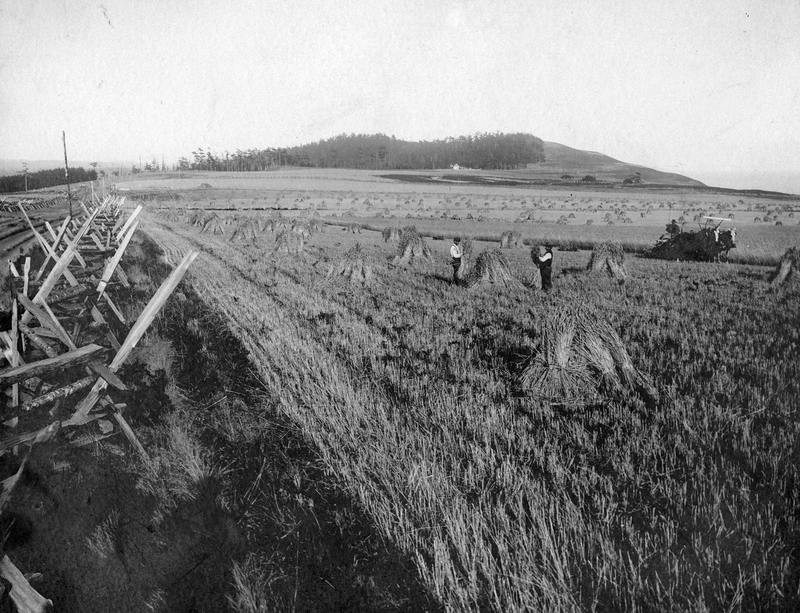 By 1886, there was enough grain production to prompt a group of men from Port Townsend to establish a mill at Argyle, a shallow water port in Griffin Bay on San Juan Island. This three-story (with basement and superstructure for accessing equipment) mill was powered by steam and ground the various grains–barley, oats, and wheat– on millstones; later, it even processed split peas. Eventually a kiln was added to the site for prune drying. However, the mill closed in 1909 due to lack of business. Early threshing was done in side-entry or center-drive barns. The center bay, along with a bay off to the side, provided an approximately 30-foot square area for the horses to walk in circles, treading on the shocks of grain. With both doors of the center drive open, and possibly oriented towards the prevailing winds, the breeze would blow the chaff, leaving the grain on the floor. It would then be gathered up and store in grain bins near the threshing floor. Steam threshers were first used in the islands in the 1870s; for instance, John H. Bartlett owned the first threshing machine on Lopez Island in 1876. Grain was harvested with cradles, and the shocks tied off and stacked up right in the fields, were gathered in a wagon and taken to the steam thresher. Threshing of grain was a community effort, and on San Juan steam threshers were either hauled from the Argyle Mill or barged over from Lopez. Crews of men from the various surrounding farms would meet at the fields to be threshed, and farm wives would vie with each other to provide ample lunches for the workers. Grain was put in sewn sacks. Grain production led to the construction of sturdy, almost windowless, vermin-proof granaries (see Granaries under Associated Farm Building). However, some ‘barns’ are in fact granaries with sheds added in order to cover the wagons from inclement weather while unloading the grain.